Connectify Hotspot MAX is the only virtual router software that gives you a real WiFi Repeater so you can extend the range of your home or office WiFi. Check out the tutorial showing you how to set up Repeater Mode here. 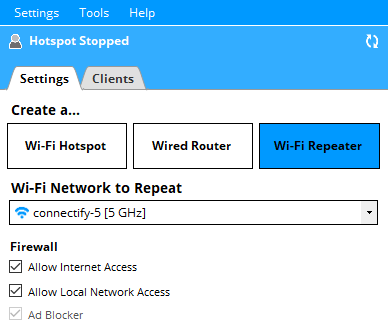 To setup Hotspot as a WiFi repeater, you must already be connected to the network you want to extend and Windows must have the password saved. On Windows 7, this means you must have the Connect Automatically option enabled when connecting to the wireless network. Connectify Hotspot can only repeat wireless networks using WPA2 security. Simply click on the 'WiFi Repeater' button at the top of Hotspot UI, make sure that the WiFi network you want to repeat is selected and start your Hotspot. It's that easy! Hotspot will broadcast an access point with the same SSID and password as the original network. Clients that connect will be bridged directly onto the original network using Hotspot's network bridging capabilities.